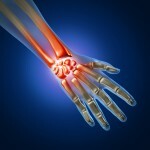 Rheumatoid arthritis is an auto-immune disease which affects the joint of the body. It can usually present initially in the small joints of the body like the hands and feet but this can vary from patient to patient. The joints and cartilage of the joints are attacked by the disease. The attacks can last a long time or can come and go. During a flare up of this disease you will experience hot, swollen and painful joints. The muscles weaken due to the pain which make use of your limbs difficult. A multidisciplinary approach is taken treating rheumatoid arthritis patients. Patient need to be seen and monitored by their GP, consultant and physiotherapist. In some cases and occupational therapy will be needed to address issues that the patient may have at home and in the workplace. As your body is under attack by the disease medications prescribed to you by your consultant are of utmost importance to take. These will help with pain, swelling and joint deterioration. Physiotherapy will help with pain relief of associated muscle spasm and joint pain. At times, splinting may be prescribed. As the feet are also affected your physiotherapist will be able to prescribe an orthotic devise or prescribe a more comfortable show for you. Your physiotherapist will also be able to prescribe an exercise programme to help strengthen muscles which were weakened by the flare up. At Archview Physiotherapy Clinic we also organise group exercises classes which are more suitable for patients suffering with arthritis. For more details call reception and one of our physiotherapists will be delighted to talk with you further.